This year, community leaders once again gathered at the St. Vincent de Paul Dining Room on the Wednesday before Thanksgiving. Everyone had a great time, and there was a lot of “cutting up” going on, even before the knives were distributed. This year’s contestants included: District Attorney Hillar Moore; Councilwoman Tara Wicker; LSU Gymnastics Coach, D-D Breaux; Tom Olinde, President of Olinde’s Furniture; Constable Reginald Brown; Coletta Barrett, Vice President of Missions at Our Lady of the Lake; EBR Coroner William “Beau” Clark; Rabbi Jordan Goldson, Congregation B’nai Israel; George Bell, CEO, Capital Area United Way; EBR Mayor-President Sharon Weston Broome; Ralph Bender, Past Board Chair, Capital Area United Way; Congressman Garret Graves; Councilman Dwight Hudson; and Ric Kearny, Senior Vice-President, Capital One. Contests carved turkeys to be served on Thanksgiving Day to our guests at the St. Vincent de Paul Dining Room. Contest winners were: First Place, LSU Gymnastics Coach D-D Breaux; Second Place, Mayor-President Sharon Weston Broome; and Third Place, District Attorney Hillar Moore. 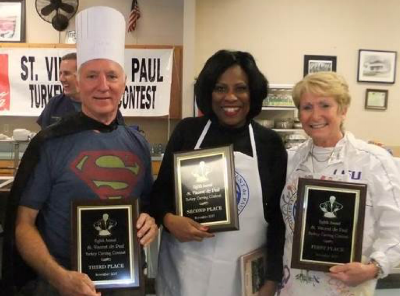 The judges were: Jan Ross, Baton Rouge Area Foundation; Pan Hutchinson, St. Vincent de Paul Volunteer; and Kay Kyes, St. Vincent de Paul Pharmacy Director. Not only is this contest a lot of fun, it also created an awareness of hunger in our community while helping us to prepare for our annual Thanksgiving meal. A big thank-you goes out to everyone that helped to make this event so special!